On October 4, 1884, Leona Florentino, the first Filipina poet in Spanish and Ilocano languages, died at the age of 35 in Vigan, Ilocos Sur. 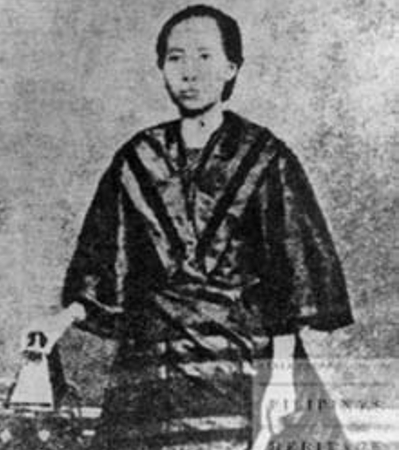 Born on April 19, 1849 to a wealthy and prominent family in Vigan, Florentino was the first Filipina poetess who established fame in the Philippines and in Europe. Her exquisite poems in Spanish and in Iloko were exhibited in the Exposicion General de Filipinas in Madrid (1887) and in the Internacional Exposicion in Paris (1889), where they attracted wide attention and won fame for her country and herself. In recognition of her literary ability, she was included in the Encyclopedia Internationale des Oeuvres des Femmes (International Encyclopedia of Women’s Works) which was edited by Madame Andzia Wolkska in 1889. The young Florentino's intelligence and lyricism was obvious at an early age when she began to write her first verses in Ilocano. Although bared from receiving university education because of her gender at that time, Florentino improved her mind by voracious reading of books. A learned Ilokano priest, Father Evaristo Abaya, curate of Vigan, taught her advance Spanish and encouraged her to write poetry. She was married to Elias de los Reyes, who, at one time, served as alcalde mayor of the province. Five children born to them, the eldest of whom was Isabelo de los Reyes, who later became distinguished man– of-letters, civic leader, and senator. Her memory is now preserved by a monument and a street in Vigan, and immortalized by the pens of historians and biographers.